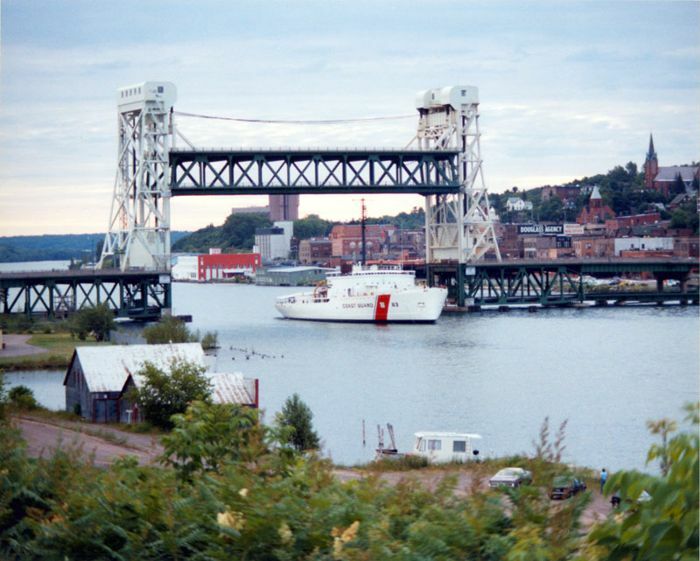 USCGC Mackinaw (WAGB-83), as she passed through the Portage Lake Lift Bridge on July 22, 1985. Design and construction began at the beginning of WW II, when it was realized that a new and radical icebreaker would be needed to keep shipping lanes open on the Great Lakes, to provide iron ore and other wartime needed commodities. 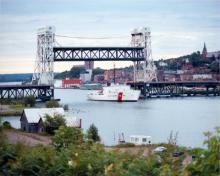 She was commissioned in early 1944, with a size design that would not allow it to be used outside of the Great Lakes. Length: 290 ft., Beam: 74 ft. It has 6 diesel engines, with a displacement of 5,000 tons, and has since been updated with a number of new innovations. Construction has now started on a replacement vessel, which is due for commissioning in 2005. [Photo:© 1999, Roland Burgan, Hancock, MI ].